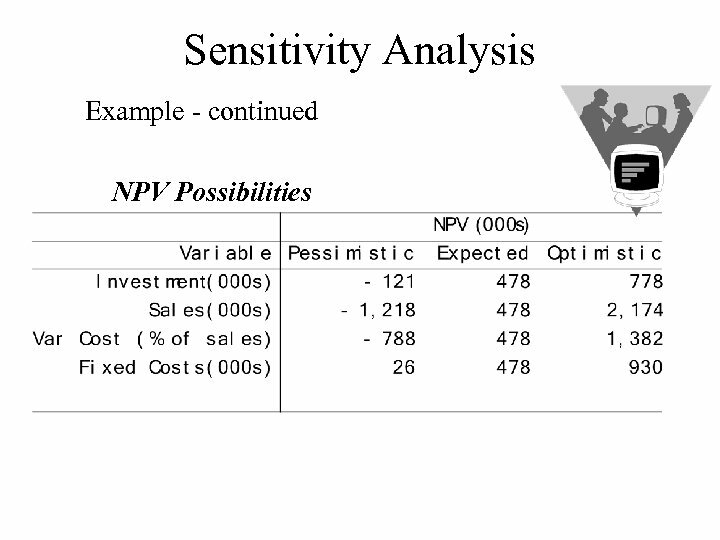 How To Handle Uncertainty Sensitivity Analysis - Analysis of the effects of changes in sales, costs, etc. on a project. 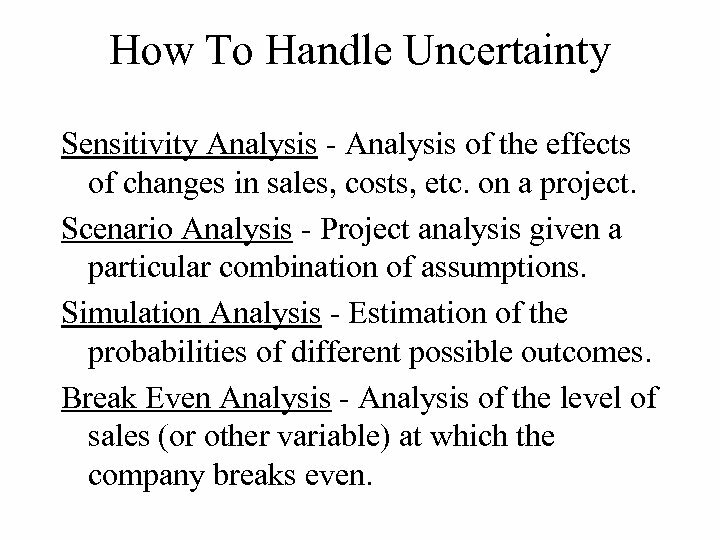 Scenario Analysis - Project analysis given a particular combination of assumptions. 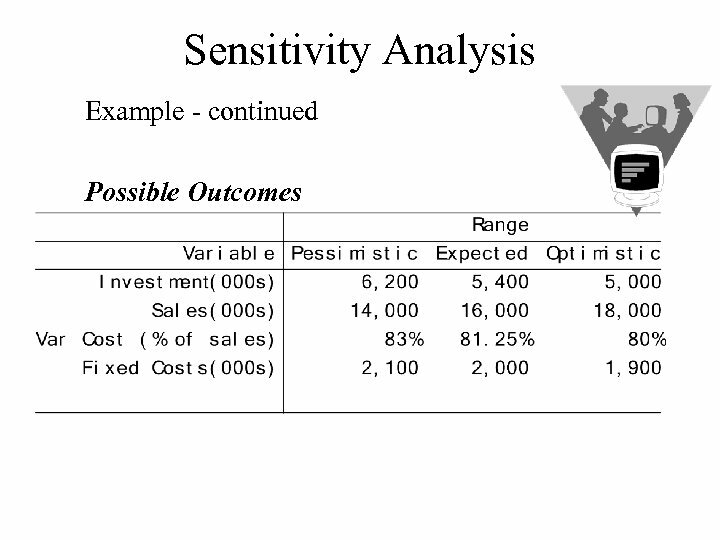 Simulation Analysis - Estimation of the probabilities of different possible outcomes. 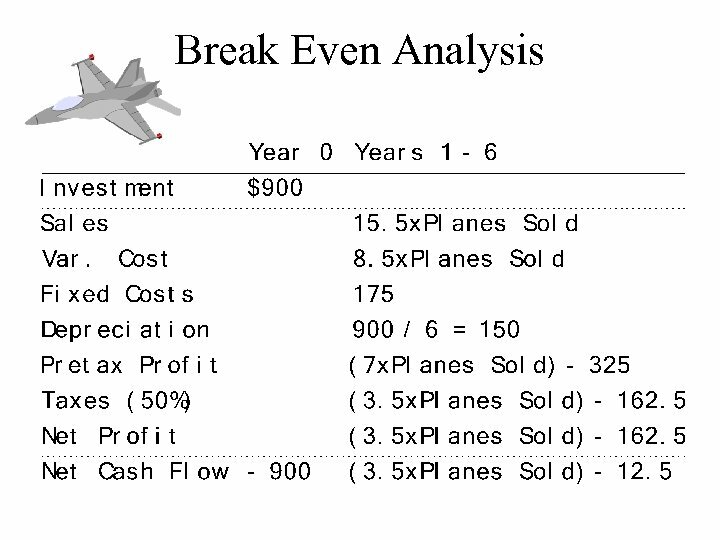 Break Even Analysis - Analysis of the level of sales (or other variable) at which the company breaks even. 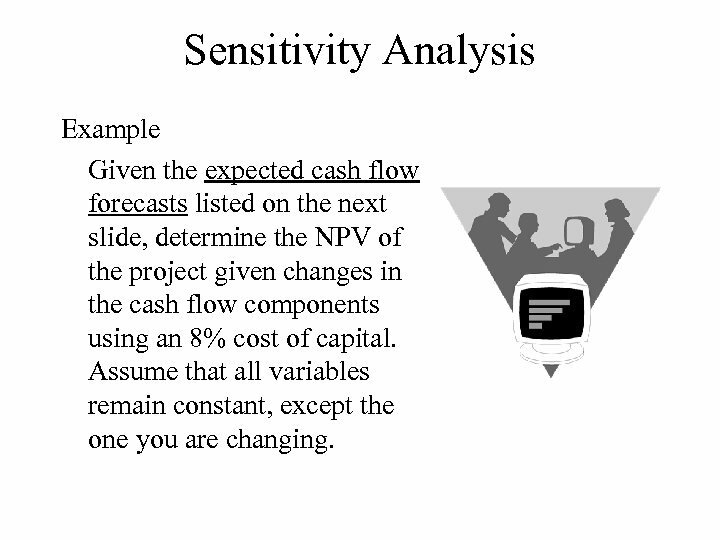 Sensitivity Analysis Example Given the expected cash flow forecasts listed on the next slide, determine the NPV of the project given changes in the cash flow components using an 8% cost of capital. Assume that all variables remain constant, except the one you are changing. 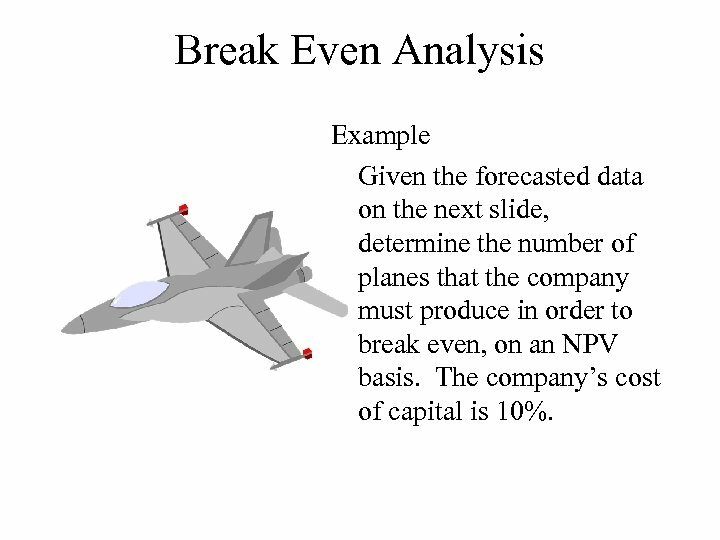 Break Even Analysis Example Given the forecasted data on the next slide, determine the number of planes that the company must produce in order to break even, on an NPV basis. The company’s cost of capital is 10%. 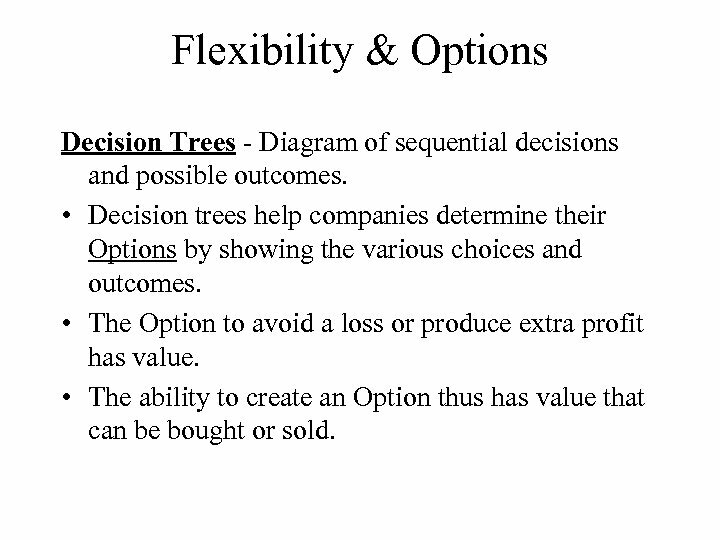 Flexibility & Options Decision Trees - Diagram of sequential decisions and possible outcomes. 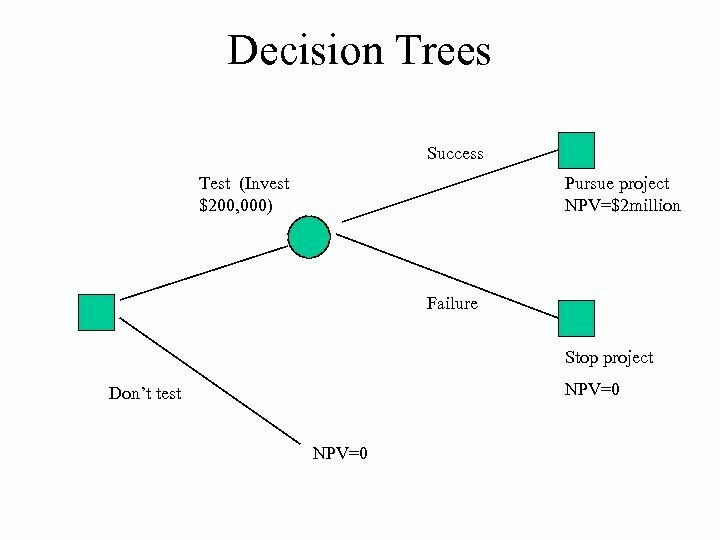 • Decision trees help companies determine their Options by showing the various choices and outcomes. 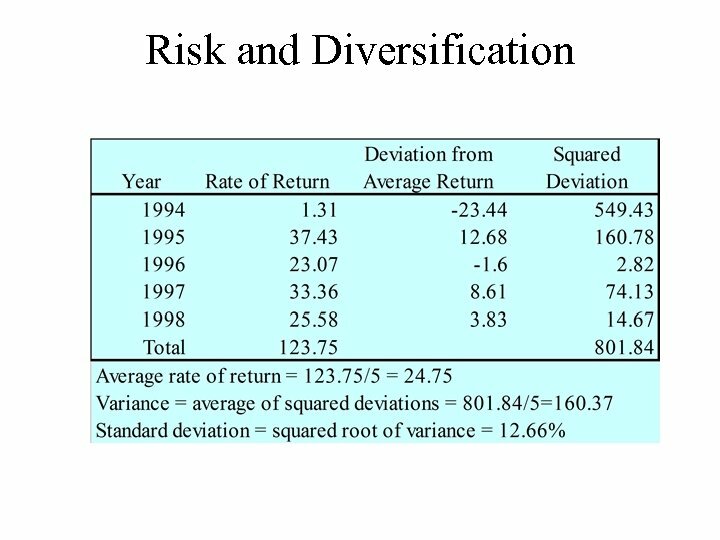 • The Option to avoid a loss or produce extra profit has value. • The ability to create an Option thus has value that can be bought or sold. 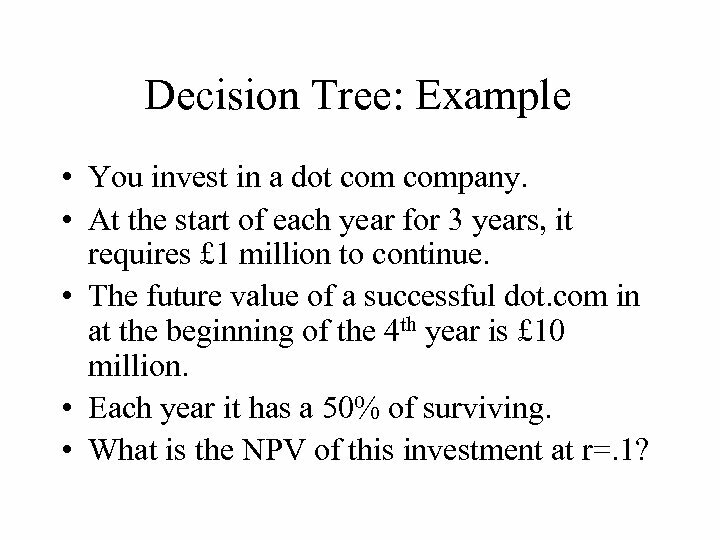 Decision Tree: Example • You invest in a dot company. • At the start of each year for 3 years, it requires £ 1 million to continue. • The future value of a successful dot. com in at the beginning of the 4 th year is £ 10 million. • Each year it has a 50% of surviving. 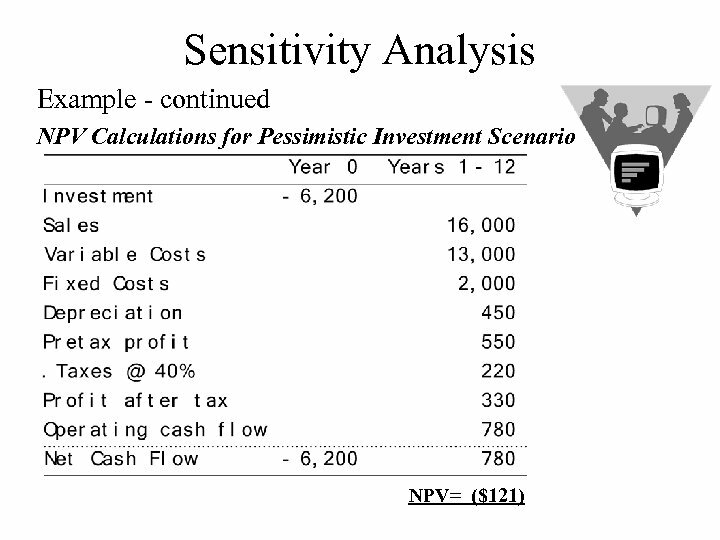 • What is the NPV of this investment at r=. 1? 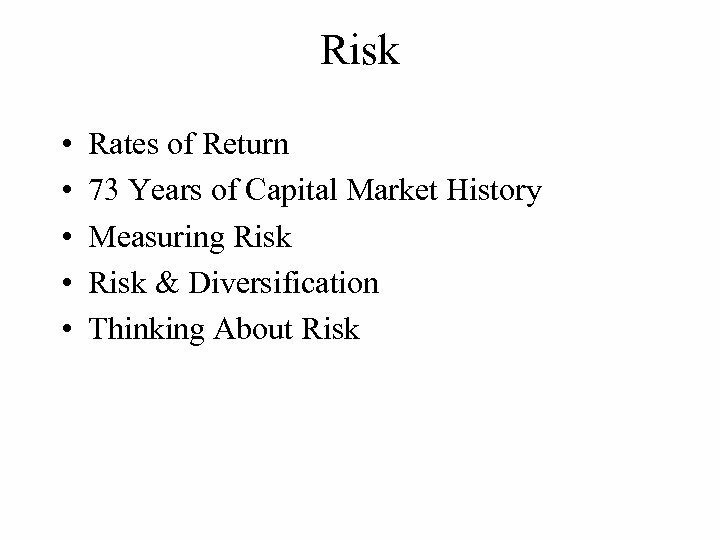 You want to be a millionaire • You have no life-lines and are risk neutral. For simplicity assume if you answer wrong you get £ 0. 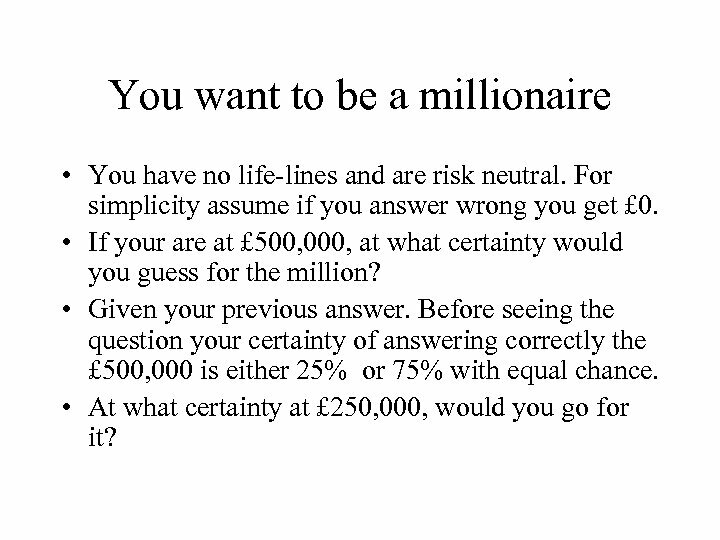 • If your are at £ 500, 000, at what certainty would you guess for the million? • Given your previous answer. Before seeing the question your certainty of answering correctly the £ 500, 000 is either 25% or 75% with equal chance. • At what certainty at £ 250, 000, would you go for it? 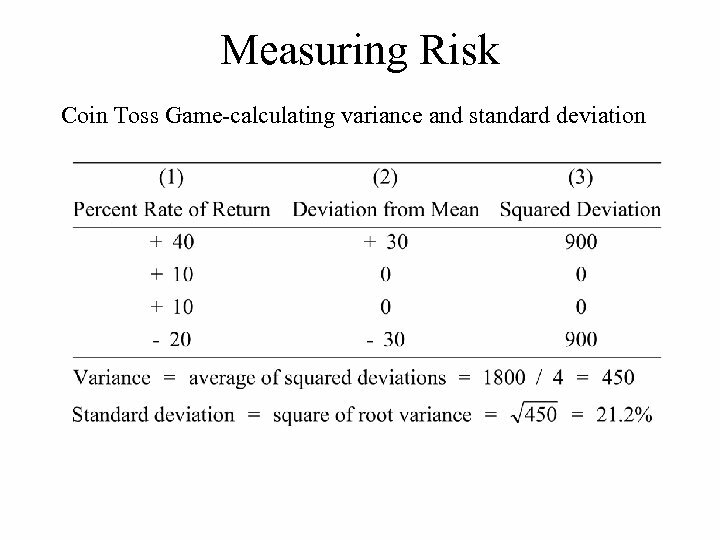 Measuring Risk Variance - Average value of squared deviations from mean. 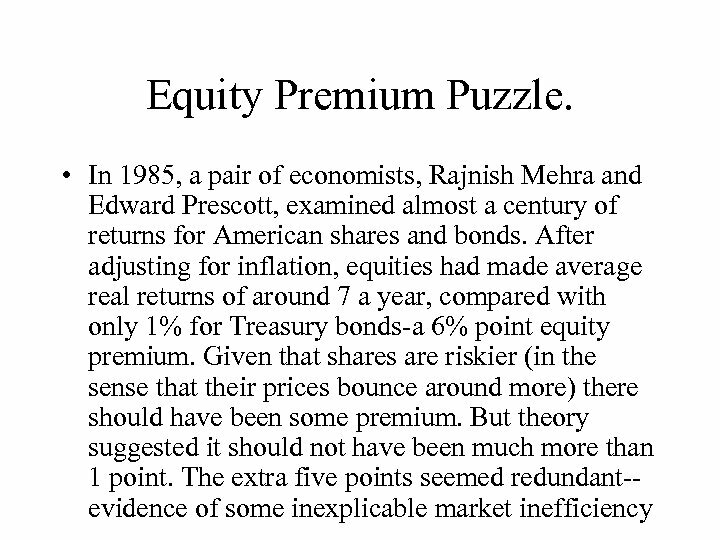 A measure of volatility. 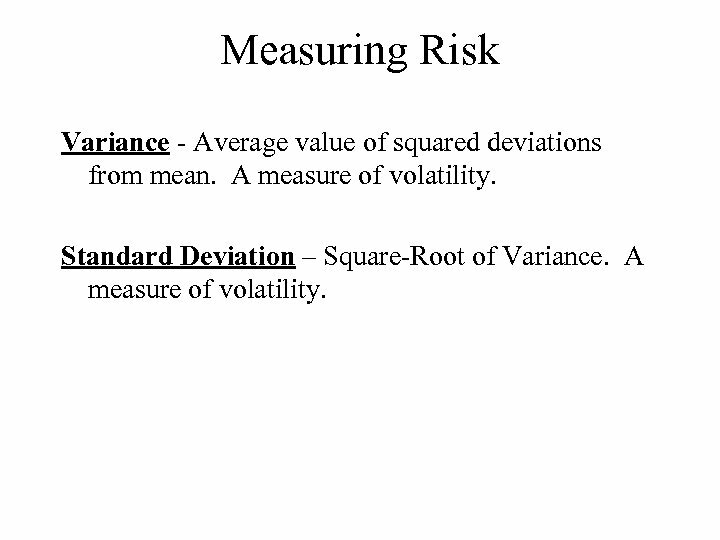 Standard Deviation – Square-Root of Variance. A measure of volatility. 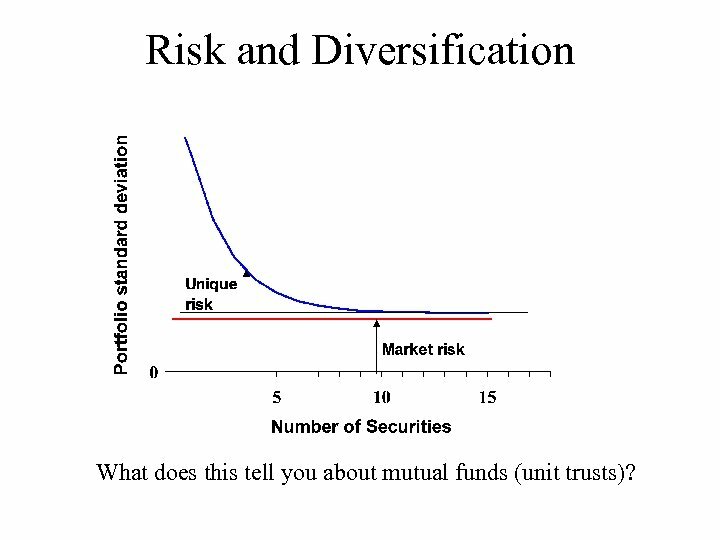 Risk and Diversification What does this tell you about mutual funds (unit trusts)? 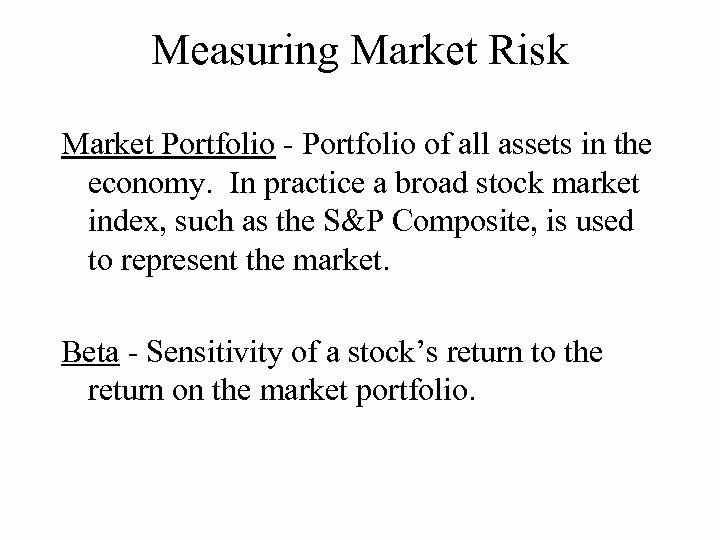 Measuring Market Risk Market Portfolio - Portfolio of all assets in the economy. In practice a broad stock market index, such as the S&P Composite, is used to represent the market. 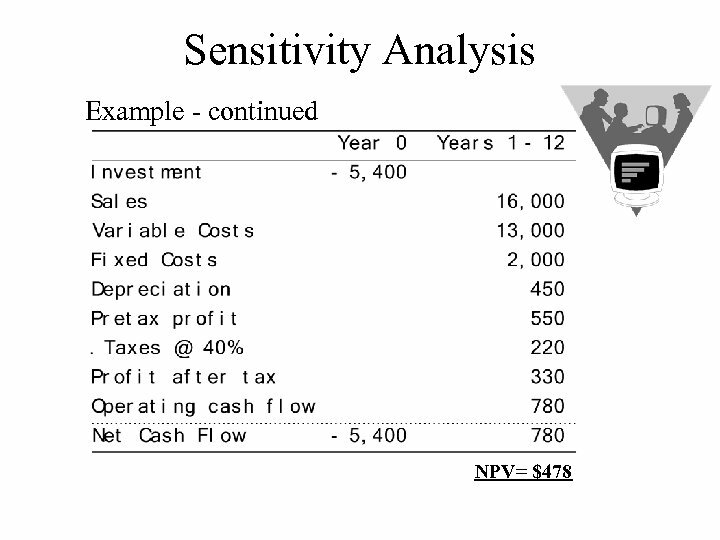 Beta - Sensitivity of a stock’s return to the return on the market portfolio. 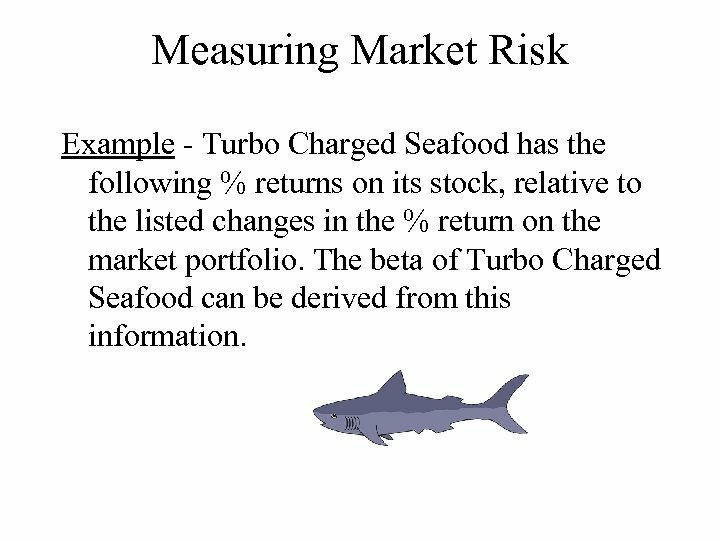 Measuring Market Risk Example - Turbo Charged Seafood has the following % returns on its stock, relative to the listed changes in the % return on the market portfolio. The beta of Turbo Charged Seafood can be derived from this information. 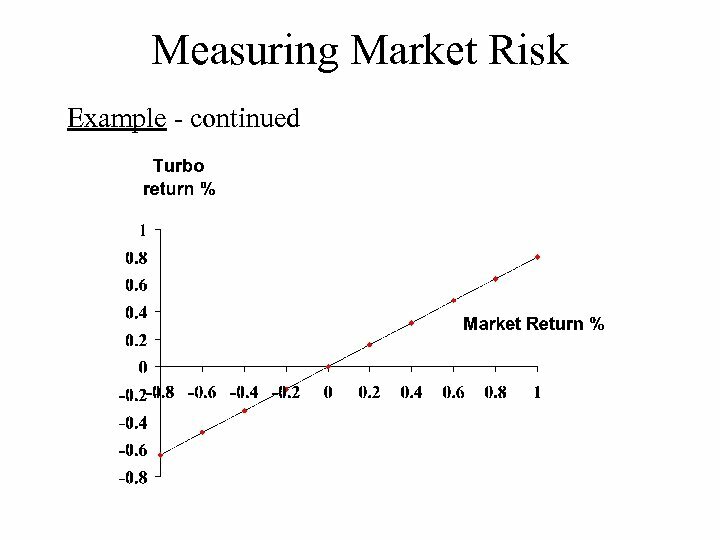 Measuring Market Risk Example - continued • When the market was up 1%, Turbo average % change was +0. 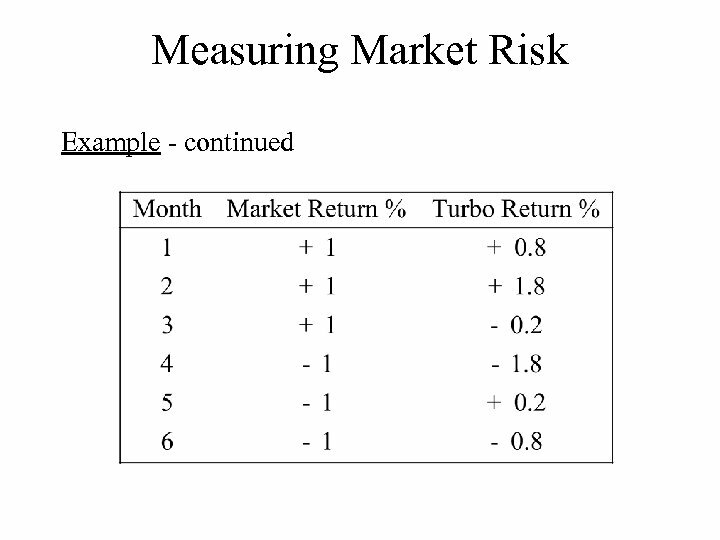 8% • When the market was down 1%, Turbo average % change was -0. 8% • The average change of 1. 6 % (-0. 8 to 0. 8) divided by the 2% (-1. 0 to 1. 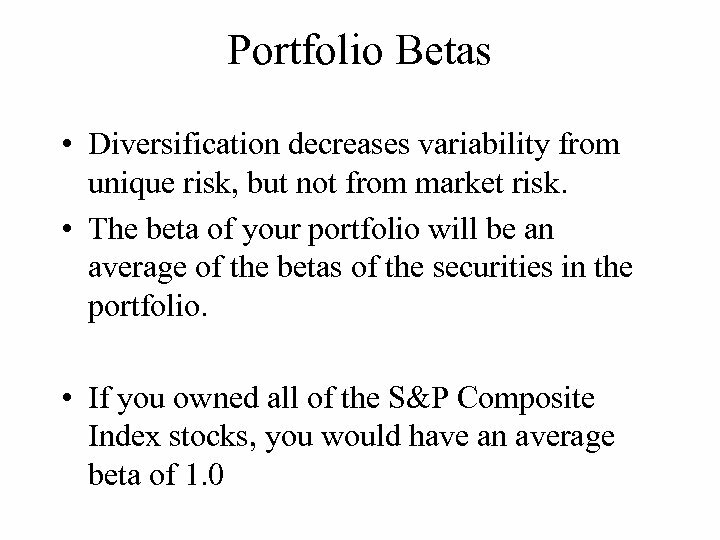 0) change in the market produces a beta of 0. 8. 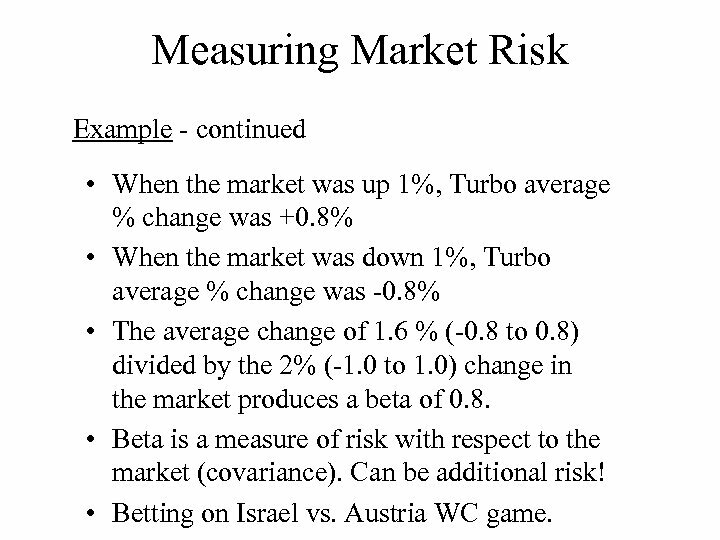 • Beta is a measure of risk with respect to the market (covariance). 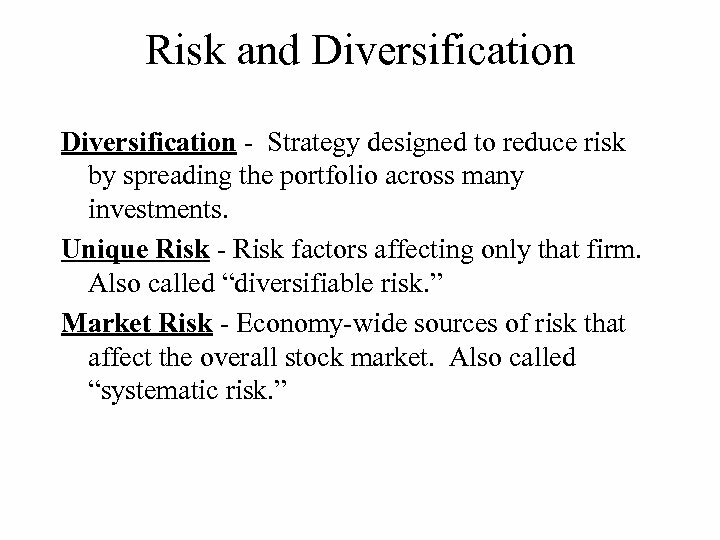 Can be additional risk! • Betting on Israel vs. Austria WC game. 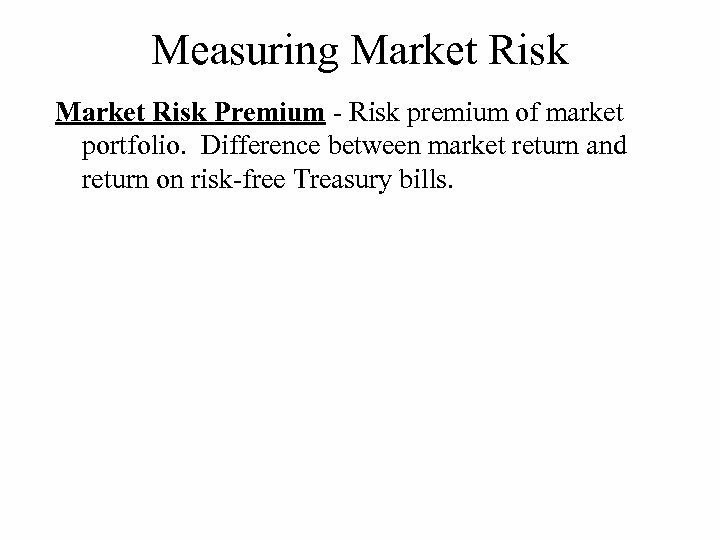 Measuring Market Risk Premium - Risk premium of market portfolio. 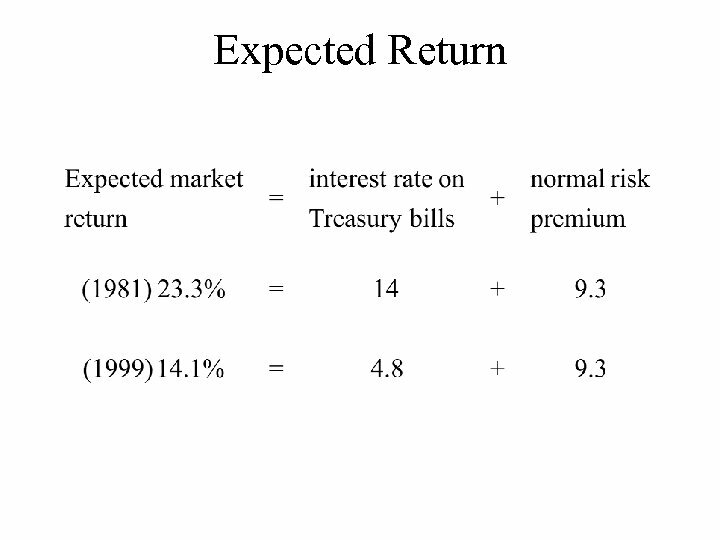 Difference between market return and return on risk-free Treasury bills. 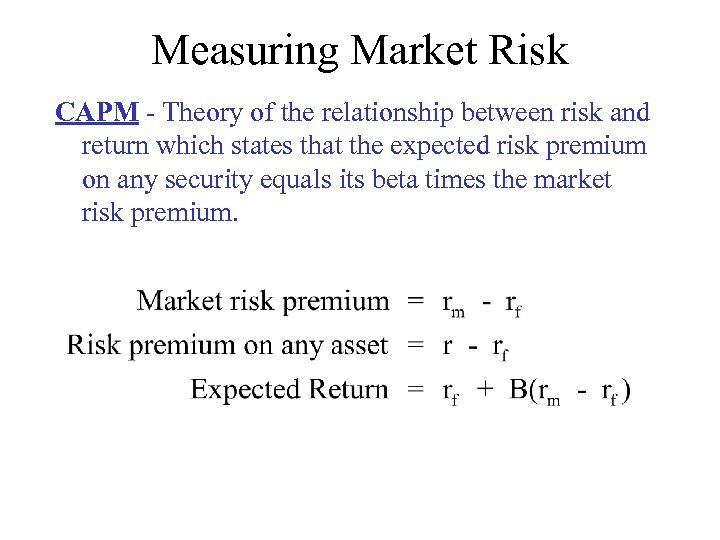 Measuring Market Risk CAPM - Theory of the relationship between risk and return which states that the expected risk premium on any security equals its beta times the market risk premium. 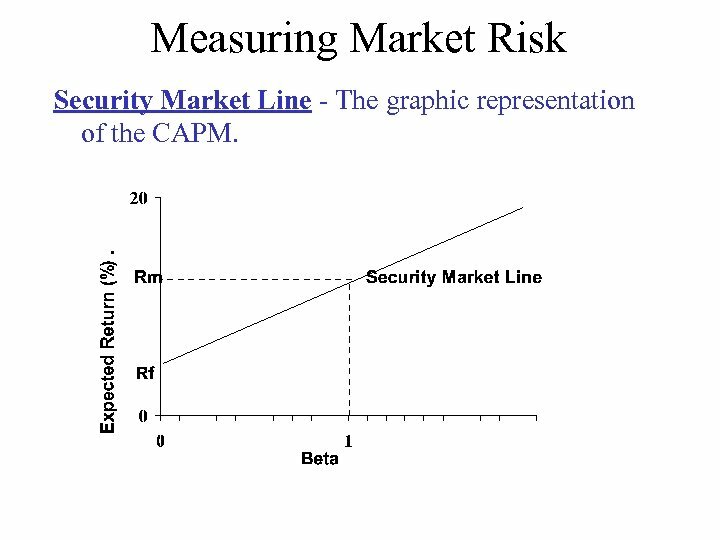 Measuring Market Risk Security Market Line - The graphic representation of the CAPM. 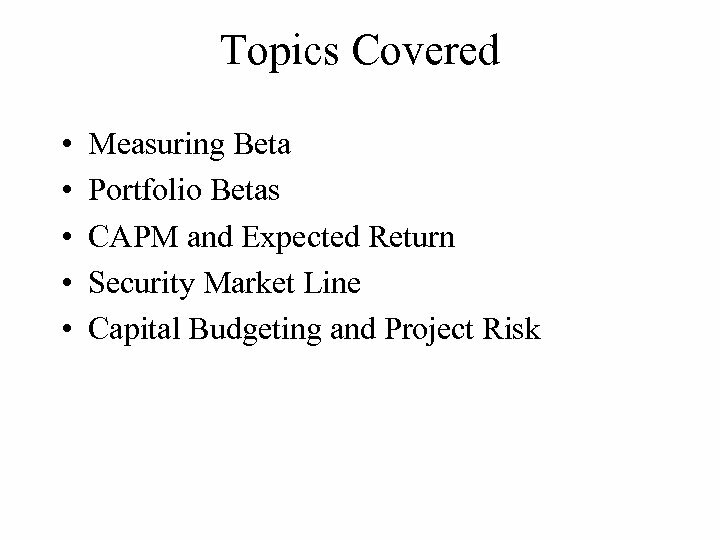 Problems with CAPM • Plotting average return vs. 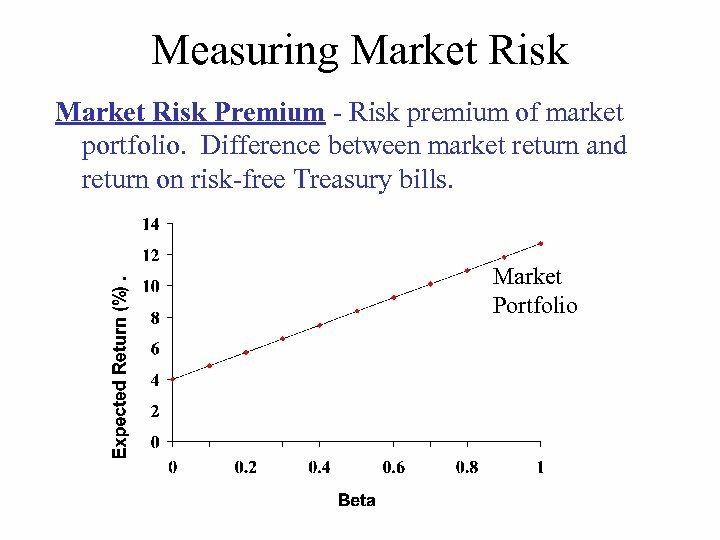 Beta, a zero Beta beats Risk-free rate. • Short term doesn’t do so well. • Unstable Betas. • Tough to test. 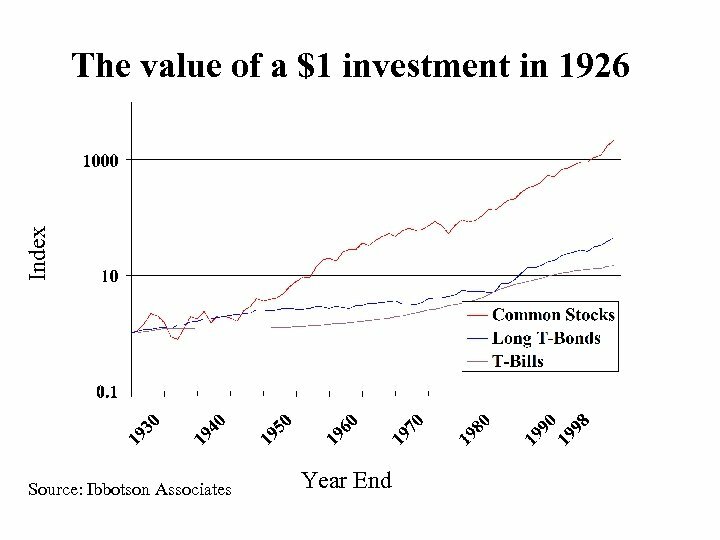 Will the real market portfolio stand up? 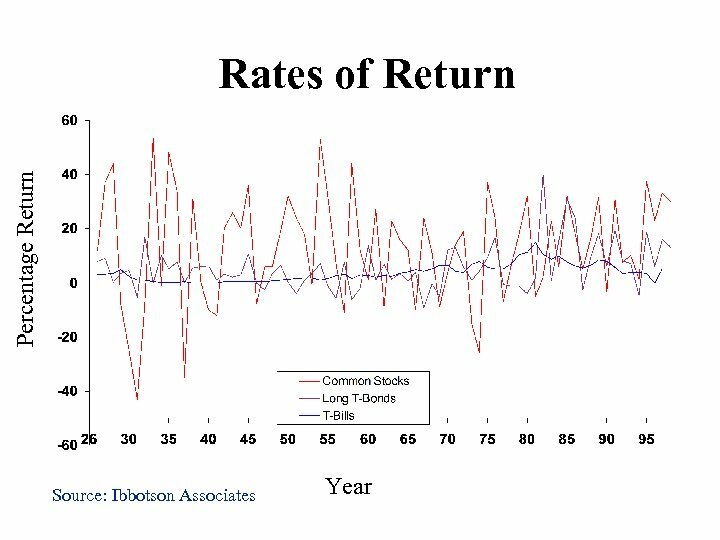 • Beta is not a very good predictor of future returns. 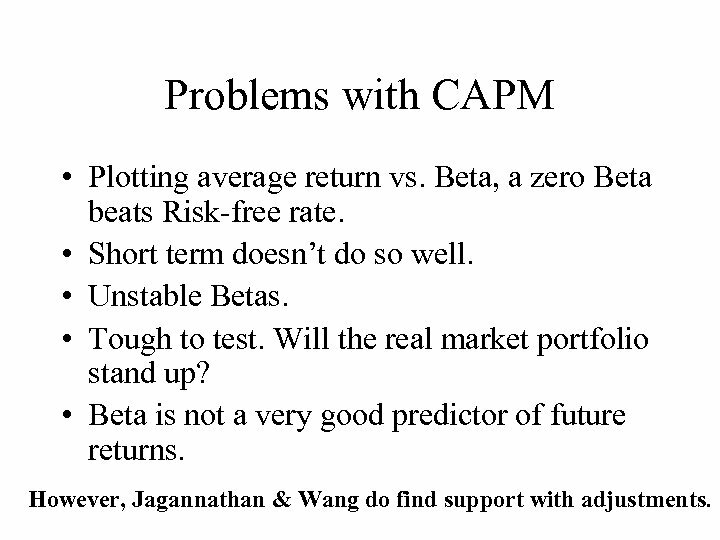 However, Jagannathan & Wang do find support with adjustments. 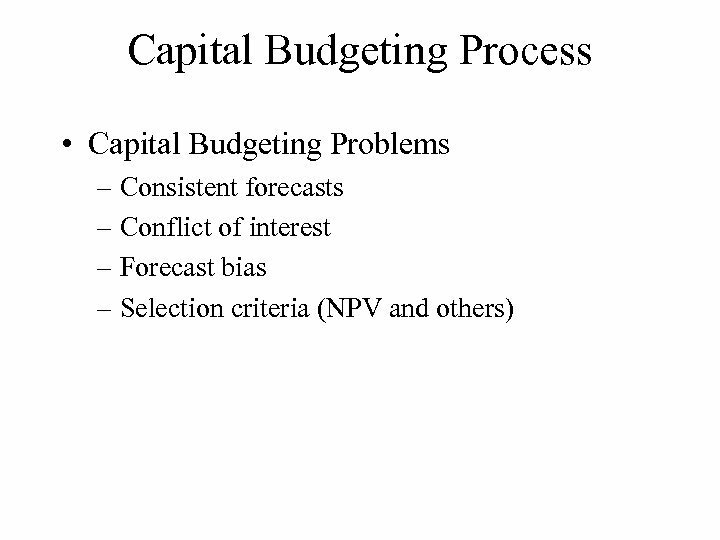 Capital Budgeting & Project Risk • The project cost of capital depends on the use to which the capital is being put. 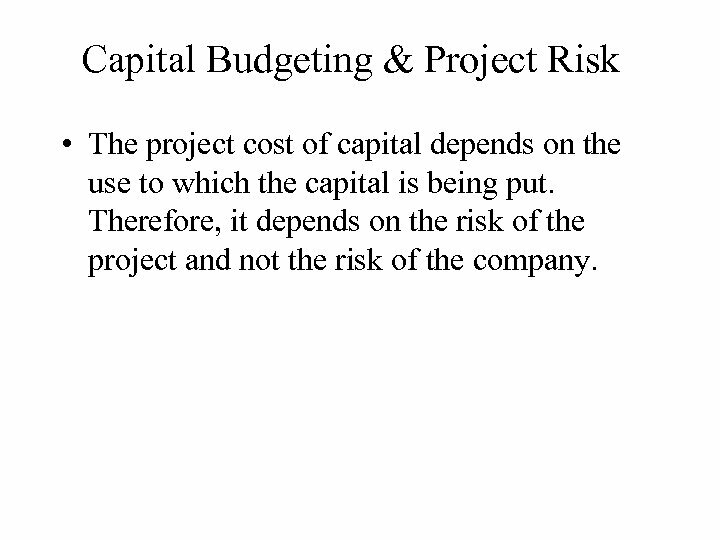 Therefore, it depends on the risk of the project and not the risk of the company. 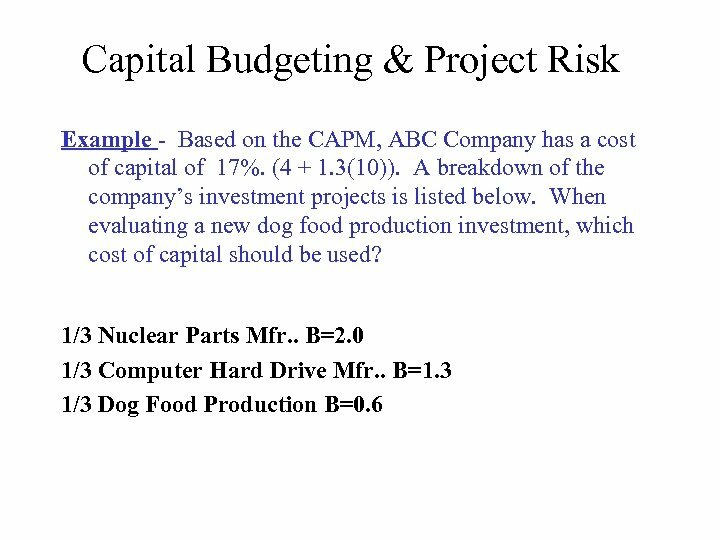 Capital Budgeting & Project Risk Example - Based on the CAPM, ABC Company has a cost of capital of 17%. 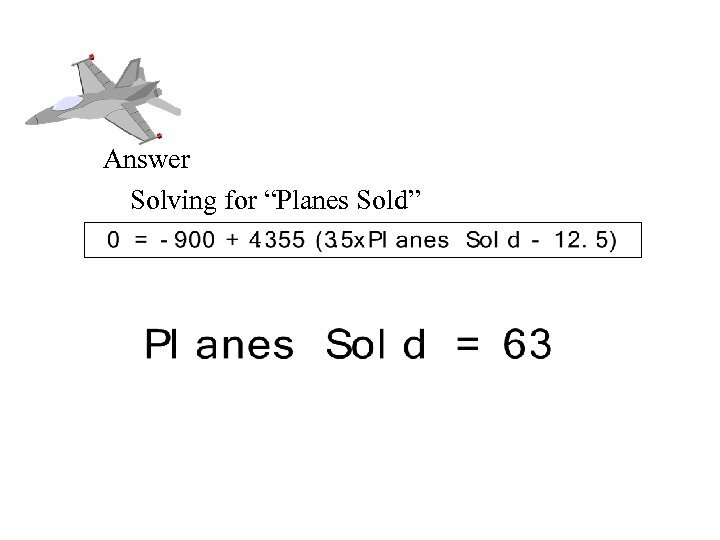 (4 + 1. 3(10)). A breakdown of the company’s investment projects is listed below. When evaluating a new dog food production investment, which cost of capital should be used? R = 4 + 0. 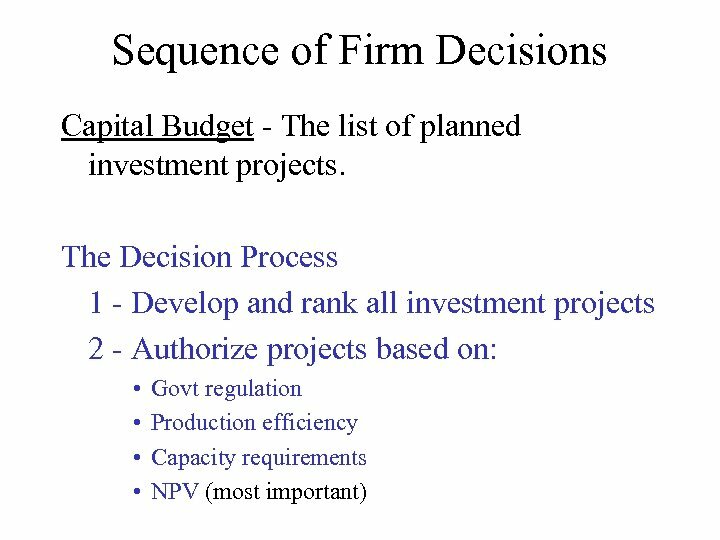 6 (14 - 4 ) = 10% reflects the opportunity cost of capital on an investment given the unique risk of the project. 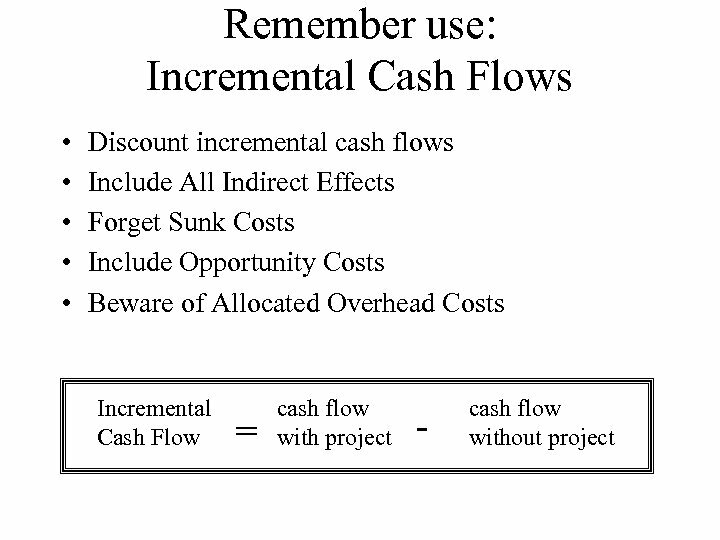 You should use this value in computing that project’s NPV!! Wait a second! 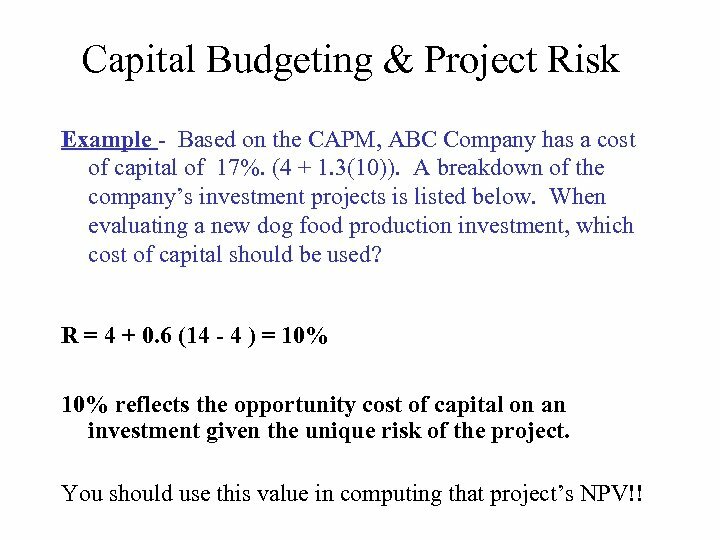 • A project has a NPV=£ 10, 000 when r=. 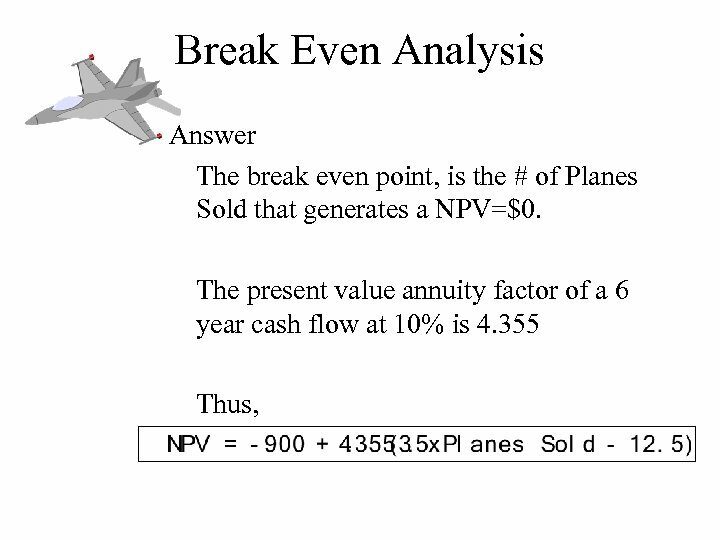 05 and a NPV=-£ 10, 000 when r=. 1 and the company can borrow at 5%. Why shouldn’t the company invest even if the cost of capital is 10% because of a beta? 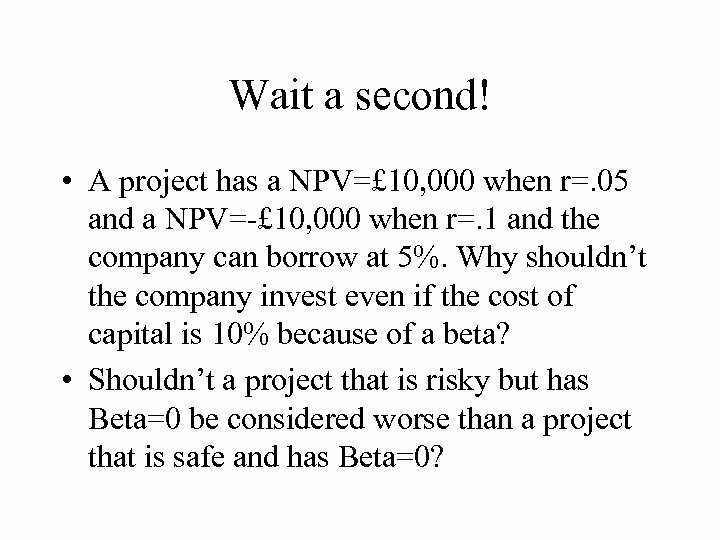 • Shouldn’t a project that is risky but has Beta=0 be considered worse than a project that is safe and has Beta=0?